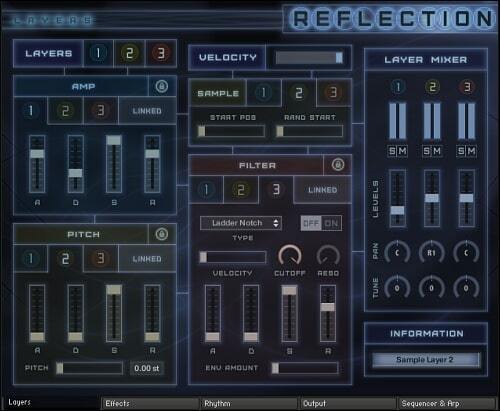 Reflection is an inspiring Cinematic Sample library and toolkit for composing Soundtracks and trailers. Perfect for anything from a subtle underscore to driving action and a whole let more. It contains 435 presets with everything from Evolving Soundscapes & Distorted ambience, to Lush Pad & complex Rhythms. It has a highly flexible interface with a multitude of tools for designing your own sounds, rhythms and arpeggiations. The tools include various envelopes to shape the sound, insert and send effects, sequencers and LFO’s to create tempo synced rhythms and an arpeggiator with powerful randomisation features. In addition, up to 3 samples can be layered and mixed either using the included samples or importing your own. Each layer can have separate Amp, Pitch and Filter Envelopes, as well as adjustment of the Sample start position. From version 1.6 you can now have separate LFO’s and filter sequences for each layer as well as adjusting the level of send effect per layer. For 1.7, you can even choose from 6 different filter types. The sound design possibilities are huge and you can even import your own samples to design with. The included samples (over 950) are exclusively recorded from two 80’s ‘toy’ keyboards and processed to get the best sound quality. The sampled waveforms have a lovely raw & imperfect character, and are a great starting point for the library. Some of the samples were also ‘mangled’ through various means to produce more complex sounds. All the samples were then meticulously designed in Reflection taking advantage of all the tools available to give the 435 designed presets provided with the instrument. Version 1.5 also introduced over 80 Raw Starter Patches containing 2 and 3 layers of samples for you to design your own sounds from scratch! As of 1.6, there are now 96. The majority of the designed patches are mapped from C0/C1 to C6 give completely different sonic feel at the opposite ends. At the lower end, the stretched sounds produce some gorgeous deep Pads and low Bass, whilst the upper notes can offer nice smooth mellow Pads & playable Synths. You are encouraged to fully explore both with all presets to get the most out of Reflection! Reflection may be small in size (just 830MB installed), but it is very big on sound quality! Please take a look and listen to the Demo’s and Video’s below to hear and see for yourself. At the bottom of the page you can download the full manual to see exactly what you can do with Reflection. What’s New in Version 1.7? © 2019 Freshstuff4you. All Rights Reserved.